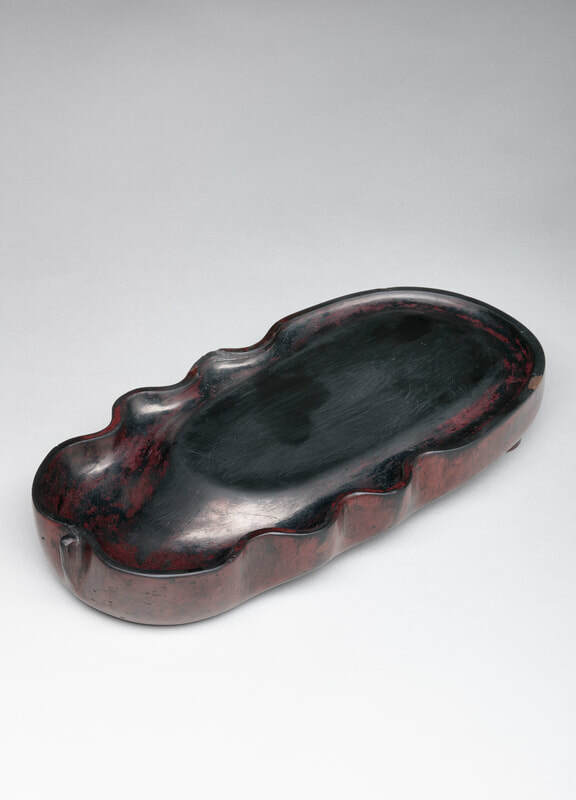 An inkstone carved in the shape of a banana leaf made from a dense and heavy unidentified stone with all but the rubbing surface covered with a thin layer of red lacquer. 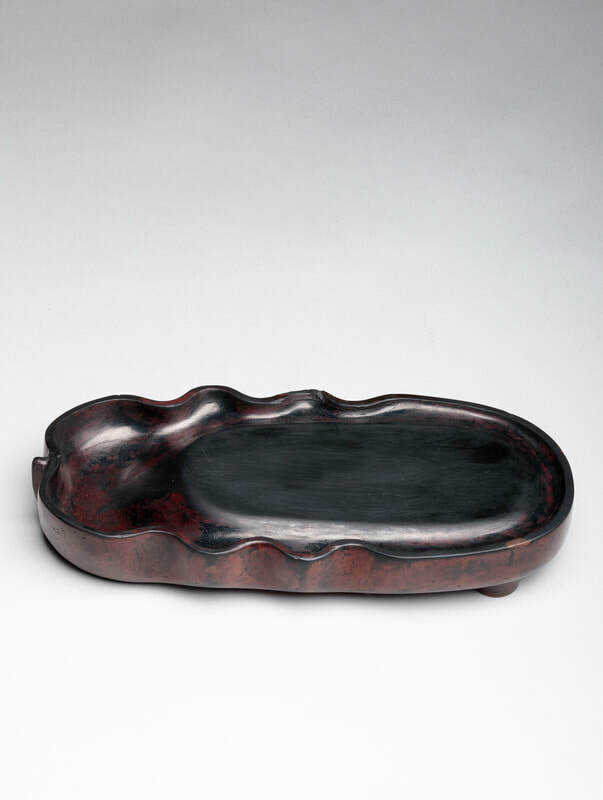 The slightly recessed, curved rubbing surface of elongated oval shape with a sloping channel between the edge of the rubbing surface and the upturned edge of the leaf with a deep ink pool towards the stem. The underside with a large oval and two smaller round feet, the flat base with an apocryphal incised eight-character inscription 其質似玉。其音鏘然and signed Zi’ang 子昂 (Zhao Mengfu, 趙孟頫). China. Late Ming–early Qing dynasty, 17th century. Private collection, Princeton, New Jersey. 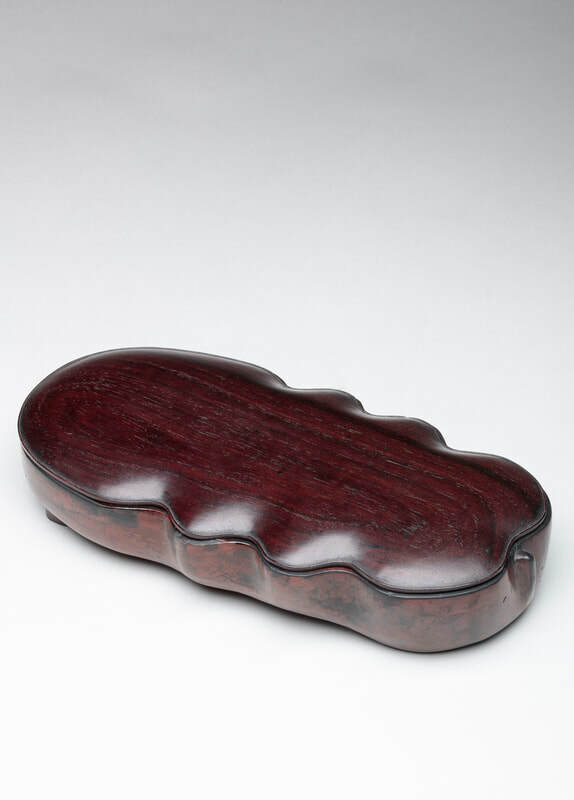 The hongmu cover, which is carved to conform to the banana-leaf-shape, probably dates from the time when it was in a Japanese collection; a Japanese wood box made for the inkstone with an ink inscription on the sliding cover, Manfu Hizo suzuri, or the secret treasure inkstone of Zhao Mengfu. 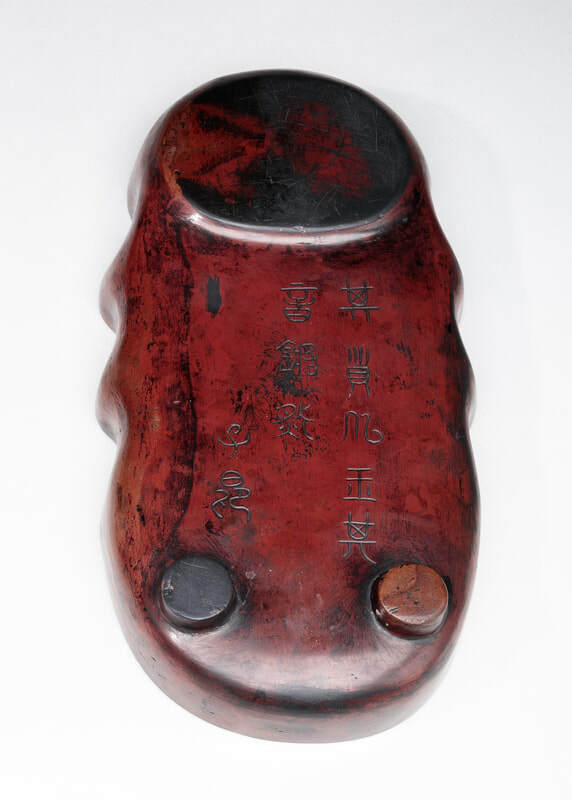 The inkstone was sold from a Japanese collection at China Guardian (Beijing) on 13 December 2008 catalogued as chengni, an inkstone made from fired silt from a river bed. 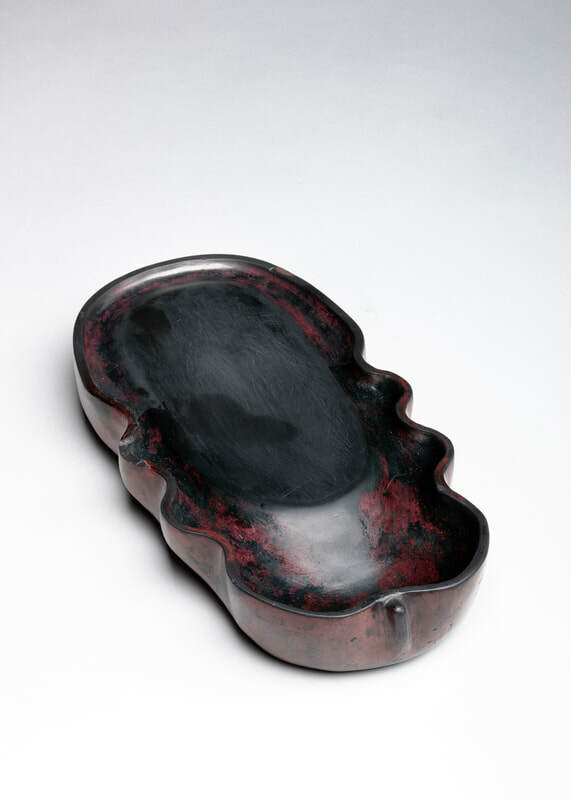 Yet, the overall weight of the inkstone, in addition to the manner in which the surface of the rubbing area has scratched, suggests that the material is stone rather than a fine fired clay. 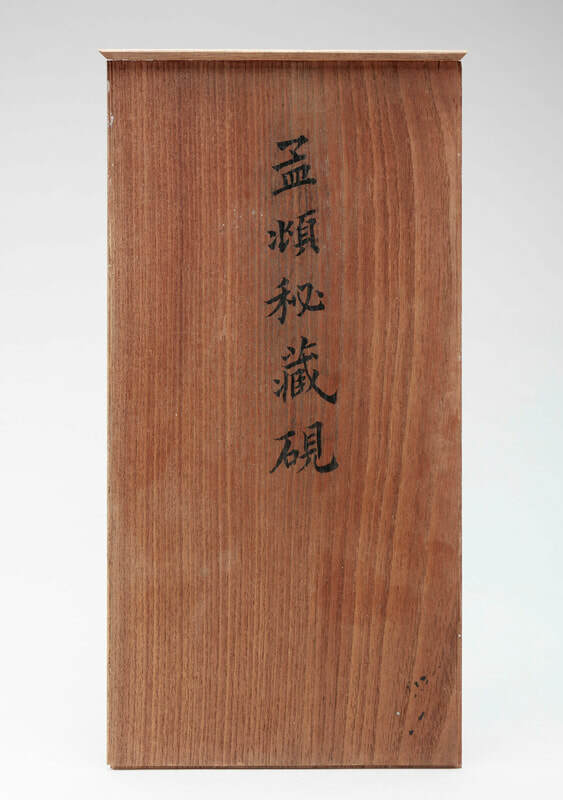 The Japanese ink inscription on the box indicates how highly it was prized by its Japanese owner.